Yesterday’s post about translucent caused concern about where to purchase Pardo translucent polymer. When Ponsawan mentioned that she gets hers from Creative Journey Studios in Georgia, I called to make sure they have a supply. They do and you can call 404-314-5767 for details. 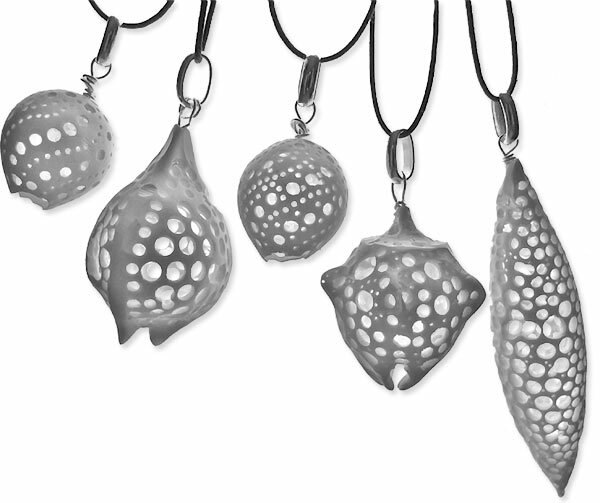 That call led me to this dazzling picture of Daniel Torres’ hollow polymer pendants. He and Natalia Garcia de Leaniz will be teaching a class on March 10 and 11 (right before Synergy) at Creative Journey Studios. There are a few spots left. Plus a bus trip from Synergy and other festivities are scheduled. In the mood for a class to beat the winter doldrums? Be sure to check out this year’s Cabin Fever, beginning February 15 in Laurel, Maryland. I’ll be there teaching along with a great cast of characters. Be sure to tune in to the free Craftcast webinar on Wednesday, January 30. The gang from the Polymer Clay Master Class book will be there with lots of tips and giveaways. It’s a party, it’s free and you’re sure to pick up a trick or two. I love these new pendants from Daniel! I love the shapes, the dots , everything! Where do we even start with Natalia and Dani? Besides being some of the nicest people you’ll ever have the pleasure to meet, they are both enormously talented and innovative artists—I seriously regret not being able to take this class. The translucent is just flying off the shelves! I got my master class book last week and i plan on doing every project cover to cover!!! I ‘m very excited to get going next week . Thank you so much Cynthia for the reminder of the class! and thanks to Louise and Randee for the nice words! I’ve been trying to locate a Canadian source for Pardo translucent polymer clay with no luck so far. By any chance has anyone located a Canadian supplier that ships within Canada?